Silversea offers ultra-luxurious all-inclusive cruises that include unlimited beverages and gratuities. Five ships in its fleet sail traditional luxury ocean cruise itineraries while the remaining four are earmarked for expedition journeys to remote regions of the world. Stellar service and butlers for everyone are hallmarks of both types of experiences. Silversea offers both luxury cruises and expedition voyages on purpose-built ships that navigate polar and exotic regions. Crew members on all ships in the fleet receive the same training and are held to the same rigorous standards. Passengers, on both luxury and expedition ships, enjoy spacious suites, personal service, gourmet cuisine and complimentary wines, spirits, beer and other beverages. The vibe is upscale yet friendly. No matter the type of voyage, passengers can expect a mix of popular ports and rarely visited destinations on destination-intensive itineraries. Accommodations aboard both the luxury and expedition ships are spacious and elegant, with a range of suites with panoramic windows or walkout balconies. Entry-level suites on the luxury ships start at 287 square feet (expedition accommodations are more snug) while the most high-end accommodations span 1,389 square feet. Every suite, from the least expensive to the top Owner's Suites, receive attention from a personal butler. Expect high-end touches like Pratesi linens and amenities such as a choice of soap, body lotion, shampoo and conditioner from Ferragamo, Bvlgari or SebaMed. On most of Silversea's luxury ocean cruise ships -- Silver Shadow, Spirit, Wind and Whisper -- meals are served open seating in the main dining room. Alternative evening dining is available in La Terrazza (an indoor/outdoor dining room featuring breakfast and lunch buffets along with evening Italian menus) and in the small, upscale (even by Silversea standards) La Dame By Relais & Chateaux. Additional dining options, from Asian to pizza to a casual grill, are found on the fleet's larger ships. Silver Muse, the cruise line's flagship, doesn't have a main dining room and instead passengers can choose to dine at any of eight onboard restaurants. Unlike on many luxury cruise lines, a few of Silversea's alternative dining venues carry surcharges. There is less dining choice on most of the line's expedition ships: Silver Cloud, Discoverer, Explorer and Galapagos. Each vessel offers both The Grill and The Restaurant. The only exception to that is Silver Cloud, which is outfitted with those venues as well as La Terrazza and La Dame. There are lecturers on virtually all cruises, offering insights into the nature and cultures of the destinations visited. Some cruises bring onboard a bridge instructor and/or a golf pro to offer lessons onboard. But, partly as a function of size and relatively low passenger capacity, there are few major educational opportunities on Silversea vessels. Each has a well-stocked library and a Steiner-managed spa and fitness center. Silversea Expeditions cruises have an additional secret weapon: the ships' expedition staff of highly trained guides and naturalists. They give lectures and accompany shore excursions so they can impart everything you need to know about the region's flora, fauna and indigenous culture. In addition, voyages are often built around visiting experts, such as scientist, conservationist and educator Dr. Birute Mary Galdikas (who is to the orangutan what Jane Goodall is to the chimpanzee) and dancers Daria Khokhlova and Artemy Belyakov from Russia's Bolshoi Ballet. It's this level of access to experts that typifies Silversea voyages. Each luxury cruise ship has a pool and hot tubs but that's not the case on the expedition ships. If a pool is important to you, select Silver Discoverer or Silver Cloud; Silver Galapagos has a hot tub only, while Silver Explorer lacks a pool but has two hot tubs. Overall, the two expedition ships that most closely approximate Silversea's traditional luxury experience are Silver Explorer and Silver Cloud, due to the extras like a theater, selection of bars, and full spa complexes with a gym and beauty salon. Silver Discoverer and Silver Galapagos both have a gym and salon, and Silver Galapagos is not the only ship sailing the region that offers spa treatments via one massage treatment room. As there are no organized children's programs on most ships in the fleet, Silversea is not appropriate for most families with young kids. However, the line's newest ship, Silver Muse, does have a kid's play room and counselors sail on any itinerary on which 12 or more children have been booked. Families who do choose to bring children onboard should be prepared to entertain them and aware that good behavior is expected in public areas. Silversea passengers are affluent. Many passengers are retirees -- former doctors, lawyers, CEOs and accountants -- with the leisure and the resources to make Silversea their cruise line of choice. You might encounter a slightly younger crowd on some expedition voyages as well as Silver Muse and Silver Spirit, the line's largest luxury ships in the fleet. Shorter voyages also tend to draw younger passengers. 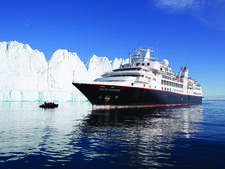 While the cruise ships tend to draw an older crowd, Silversea Expeditions appeals to that demographic as well as younger professionals with a desire for active cruising that includes posh cabins and stellar service alongside Zodiac expeditions, snorkeling excursions and in-port hikes. In terms of nationality, usually about 50 percent are from North America, with the other half coming from all over the world (predominantly the U.K., Europe and Australia). Silversea's elegant ships are of several different sizes but of one class -- all-suite, all-inclusive, all-frills-all-the-time vessels. 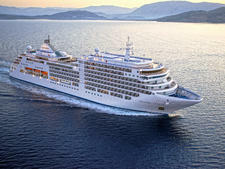 Silver Cloud and Silver Wind, each at 16,800 tons, are roomy, intimate vessels. Silver Cloud carries 254 passengers while Silver Wind carries 298. The passenger/space ratio on these ships is among the industry's highest. Silver Shadow and Silver Whisper, at 28,258 tons apiece, each carry 382 passengers, and they've taken the company's passenger/space measure to even greater heights. Each of the four vessels is the result of the work of two Italian shipyards. The hulls were laid in the Francesco Visentini yard near Trieste, after which they were floated and towed to their final outfitting in the T. Mariotti yard in Genoa. All were designed by the Oslo-based marine architect team of Petter Yran and Bjorn Storbraaten. The ships' officers are Italian, and the service staff is international, mainly from the Philippines. Because of the restrictions imposed by their size, the smaller ships are light on entertainment opportunities. The ships are too small to have significant theater facilities. The two later vessels, however, include rooms in which more extravagant entertainment can be presented. 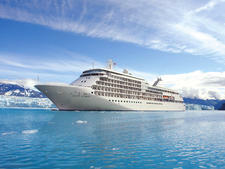 Silver Spirit, launched in December 2009, was Silversea's first new-build since 2001. The 608-passenger vessel offers 270 oceanview cabins, and all but 12 have balconies. The ship also boasts a supper club-style specialty restaurant. Diners can enjoy gourmet cuisine and jazz in an intimate, clublike setting and show off their fancy footwork between courses. Silver Muse, which will launch in April 2017 will be based on the same design as Silver Spirit, according to the line, although the ship will be slightly bigger at 596 passengers. 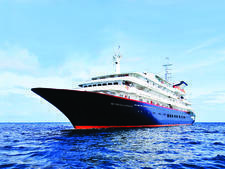 Silversea also has an expedition fleet, currently consisting of three ships. Silver Explorer, built in 1989, is of quite another breed. It's the first vessel not custom-built for the line, although an extreme makeover in 2008 brought its style somewhat closer to that of Silversea's other ships. The 6,062-ton vessel carries just 132 passengers in 66 oceanview cabins. 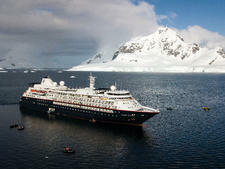 It offers all the amenities of a luxury ship -- spa, elegant dining room, flat-screen TVs -- but also has an ice-rated hull and carries eight Zodiac vessels for up-close explorations. The second expedition ship, Silver Galapagos, underwent an extensive interior makeover, and the 20-year-old, 100-passenger vessel cruises the Galapagos under the Silversea banner. In March 2014, 5,218-ton, 128-passenger Silver Discoverer -- the former Clipper Odyssey -- joined the fleet following an extensive refurbishment. It sails the far-flung regions of the globe, including Polynesia, Micronesia, Melanesia, the Russian Far East and the Kimberley, Western Australia.